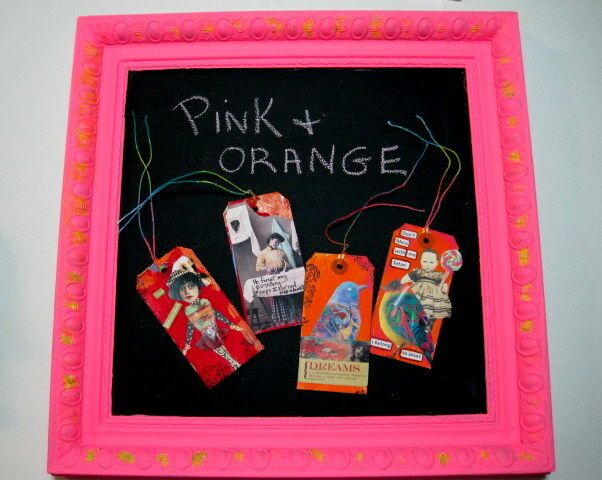 KIM COLLISTER STUDIO: OCTOBER 11 ~ 31 DAYS OF PINK ... & ORANGE! The challenge this week at Inspiration Avenue is "ORANGE". October is the perfect month for PINK & ORANGE. So this submission today is for both, ..... 31 DAYS OF PINK and the Inspiration Avenue Challenge theme this week which is ORANGE. The frame above is a work in progress. I rescued it from Good Will and I haven't quite decided how I want it to go . It started out as a thought for a place to hang tags, then as I was digging through my washi tape, I thought maybe I will use it for a place to store rolls of tape. Now my mind is all over the place, so when the dust settles, I will show you what I actually did with it. Until then, it turned out to be a great frame to photograph my tags for the IA challenge theme of ORANGE. I just created a bunch of new tags for my Etsy shop and here are three of them that fit the bill nicely for ORANGE. Hugs and give a shout out today for PINK! Be sure and check out all the ORANGE at INSPIRATION AVENUE! I love these tags, Kim! 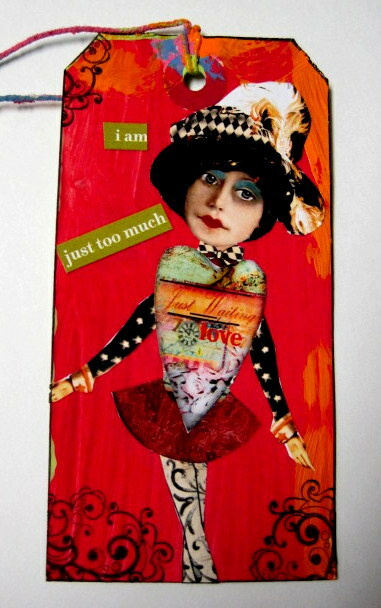 Especially the Too Much lady! You just brought back a memory about pink and orange. When I was a teenager, my mom let me redo my bedroom in any colors I wanted. I chose pink and orange! It was *mod* and so awesome...I loved it. How funny Maggie. My mom let me do my room in lime green and pink! I still love those two colors today! Aren't colors wonderful? Your tags are a riot! 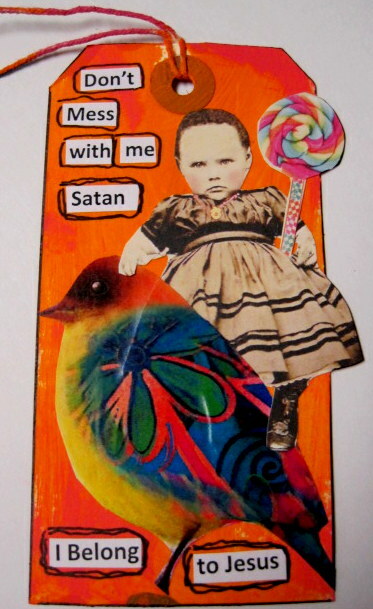 I love the Satan one! They look good in that cool frame. Hi Kim! I'm so glad you joined in on the IA Orange challenge. Your tags are fabulous! I just made something pink to share today. Happy Friday! I love orange and pink combined - it makes for funky vibrant joy :-)!! Great frame, look forward to seeing what you use it for in future but meanwhile it does beautifully showcase your gorgeous tags. 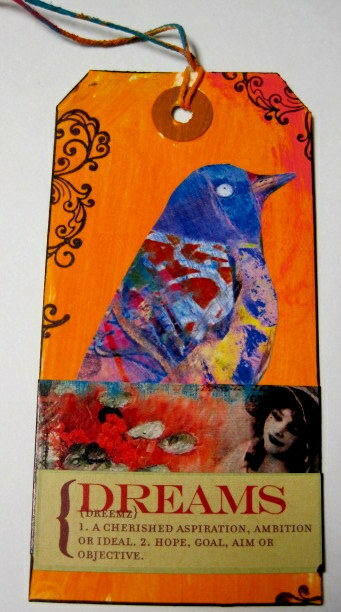 These tags are gorgeously rich in colours and my favourite has to be the 'dreams' bird one, although all are great. Hope you are well & all is good.